World Lager Estrella Damm is an award winning premium pale lager brewed in Barcelona. Passion for excellence has resulted in Estrella Damm still being made according to the original 1876 recipe, brewed with only the best 100% natural ingredients including pearl rice, a very Mediterranean ingredient that characterises Estrella Damm's unique flavour. 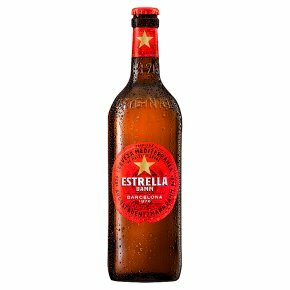 Estrella Damm is the perfect accompaniment to any dish; light and refreshingly drinkable, with a perfect balance between fresh grainy malt and subtle fruit, rounded off with a peppery bitterness and a clean finish.